Lightness, luxury and the joy of living! Tradition and lightness, luxury and joy of living – how do they fit together? 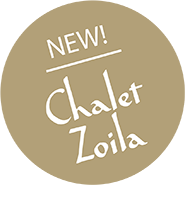 Our Chalet Leckplått and Chalet Zoila are located in the immediate vicinity of Avelengo, not far from the spa town of Merano, after a short drive up the mountain, on the “southern balcony of the Alps”. Each of the two houses has its own soul, marked by the people who have lived there for several centuries, from their stories and lives. We have collected and assimilated the traces of these stories and lives and as such, these two historic houses have become special holiday homes – houses that inspire, cheer and enchant. The Leckplått – is a traditional name and is actually a slab of rock, on which our house was built 500 years ago. It’s no surprise that it still stands here and will do so for many generations to come. This is our time now and, we know how to enjoy it. But sharing is a pleasure in itself and we want to share the delights of our holiday home. Get to know our house on the Leckplått, and you’ll also learn something about us. What a story: the female Spanish name Zoila originates from Greek and means “full of life”! It’s also the name of the woman who owned this house for a while and lived here. Many stories are intertwined around Zoila Fromm and her family. Some we can tell you, others will still have to be discovered. A box full of papers, letters, documents await the explorers. Hafling is located about 10km from Meran, the city immortilised by the frequent visits of the Empress Sissi. Famous too for its thermal baths, the botanical gardens at Castle Trauttmansdorff and of course the racecourse – a keyword! Yes, that’s us! Hafling is the home to a special breed of horses, famous throughout the Alps – strong, blonde “worker bees”, on which one can rely on in the mountains. A cafè, some restaurants and the bus stop (also for the skibus) are all within walking distance. 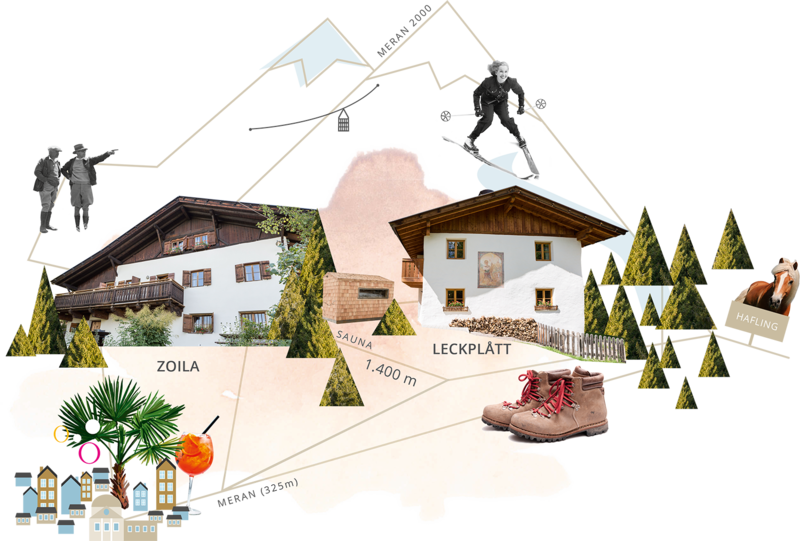 The ski resort and walker’s paradise of Merano 2000 is quite closeby as are the many tracks for hillwalkers and mountainbike enthusiasts which you can set off on from right outside our door!